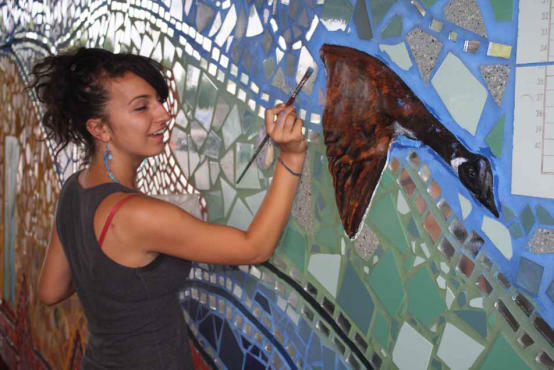 A volunteer works on the Chicago Public Art Group's Indian Land Dancing, a mosaic at Lake Shore Drive's Foster Avenue overpass. CPAG artists lay tile for a mosaic. CPAG works on Urban World at the Crossroads, a mural at Orr High School (Chicago Ave and Pulaski Rd). CPAG works on a mosaic for Water Marks, an installation at Navy Pier. Pounds will show these images Friday 9 at Imagine…Action!, CPAG’s 40th-anniversary fund-raiser, when the artist collaborative looks back at the 800 projects it has created since its formation in 1972. Held at 600 West Cermak Road in Chicago’s Creative Industries District, the event will be catered by local chefs Mike and Pat Sheerin (Trenchermen), Ryan Poli (Tavernita), Chris Pandel (The Bristol and Balena) and Jason Vincent (Nightwood). Read more after the jump. CPAG was founded as the Chicago Mural Group by artists John Pitman Weber and the late William Walker. At the time, artists were taking action against racial injustice and the Vietnam War. Largely due to the work of artists like Walker, Chicago became the birthplace of a nationwide community muralist movement. “[CPAG] really was founded out of this desire…[to have] artists of different races—and, very quickly, different genders—working together in public because this was a deeply segregated city,” Pounds says. According to Pounds, CPAG created the country’s first community-based mosaic in 1980, when it constructed Miriam Socoloff and Cynthia Weiss’s Fabric of Our Lives with 50 local volunteers at the Bernard Horwich Jewish Community Center in Skokie. Water Marks (1998)—an installation of mosaic benches and walkways at Navy Pier that Pounds, Weiss, Olivia Gude, Kiela Smith and Mirtes Zwierzynski created with hundreds of volunteers—is the organization’s most expensive project to date: It cost $250,000 and took three years to complete. At 6,500 square feet, Johanna Poethig’s Loop Tattoo (2005)—a mural painted outside 63 East Lake Street that depicts the Loop's artistic culture—is CPAG’s most sizable endeavor. Pounds says CPAG incorporated ideas that aren’t quite as “picturesque” into pieces like the 1975 mural Wall of Daydreaming/Man’s Inhumanity to Man (47th St and Calumet Ave), which challenged Bronzeville’s predominantly African-American residents to consider the effects on their community of drugs, arson and greedy power brokers as well as the KKK, racism and police brutality. But CPAG's messages aren’t negative: The organization hopes its work causes passersby to reflect on “more complex values,” Pounds says. For example, Gude’s 1992 mural Where We Come From… Where We're Going (56th St and Lake Park Ave) presents community members’ insights into their spiritual and metaphysical paths. Tickets to Imagine…Action! are available at cpag.net. Enter to win a pair from TOC here.